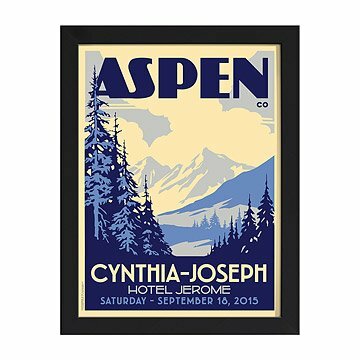 This personalized artwork captures the romantic beauty of the great outdoors. Whether you said your vows at the foot of a snow-capped mountain or surrounded by acres of lush rolling hills, this personalized artwork captures the understated beauty of the great outdoors and conjures priceless memories of a wedding in the country. Chicago-based artist Alexander Doll sets scenes of wedded bliss in the context of classic print announcements that are as stunningly unique as they are timeless. This nostalgic print hearkens back to the nuptial announcements of yesteryear with its sharp, sans serif typography, and hand-sketched illustration of the peaceful scenery. Doll incorporates personal details, such as the venue, city, date, and the couple's names. A sophisticated way to fete an unforgettable occasion, this inspired gift captures the couple's version of their fairytale while giving them a stylish and whimsical work of art to remember the thrill of the day with every passing glance. Printed on archival paper using archival pigment ink in Ohio. I am so extremely happy with this purchase! The print was even better I expected. I'm so excited to give it to my daughter and son-in-law. I'm sure they will appreciate the fact that it is so individualized to them. This is the second time I have given this as a wedding gift and both times the bride and groom have chosen to bring it along (both destination weddings) and display it at their wedding reception. I'm so happy with this artwork! I absolutely loved this poster my husband got me for our anniversary. It was such a unique gift, it literally made me cry. He customized it with our wedding location, dates, etc. and chose a mountain backdrop that reflected our ski lodge wedding. It's something we will keep in our home forever to remind us of that special day. A hit at the wedding reception! The gift was perfect for their Santa Fe, NM wedding. I'm glad we chose the smaller of the two sizes, as it will be easier to hang in their home. The colors (red/yellow/grey) were vibrant, the lettering with the pine trees and mountain scenery were exactly what we wanted. Everyone at the wedding thought it was beautiful and unique!